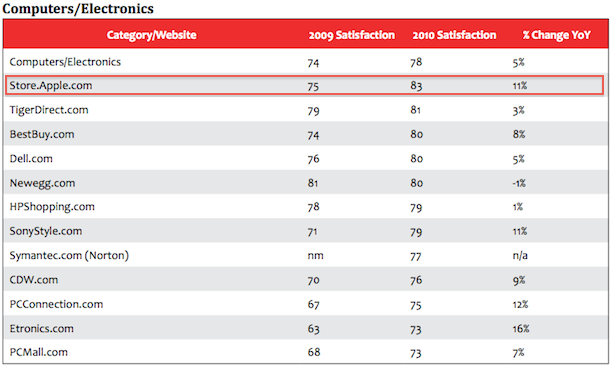 Apple continues to dominate the news cycle, this time with high scores in a consumer satisfaction survey. The survey of 23,400 online shoppers determined that Apple ranks number one among online electronic and computer retailers. Additional bragging rights for Apple include ranking number four overall for consumer satisfaction, behind only Netflix, Amazon and Avon. Impressive stuff! I have to say that this doesn’t surprise me too much. I’ve had some really positive experiences with Apple lately, it’s one of the few stores I actually look forward to purchasing things from.